Ichthyosaurs first appeared in the Lower Triassic alongside the placodonts and nothosaurs. They were the most highly specialised of all aquatic reptiles, and evolved to become top marine predators, yet maintained essentially the same body shape throughout most of the Mesozoic Era - about 150 million years. Like nothosaurs, thalattosaurs, crocodilians and other amphibious reptiles, plesiosaurs would almost certainly have been ectothermal as are modern crocodiles. These usually sun themselves during the day, taking to the water whenever the body temperature rises to its optimum, and again during the night when the temperature of the air falls below that of the water (Cott 1961; Cloudsley-Thompson 1999). In contrast, the ichthyosaurs may well have been endothermal as some of the larger theropods and dinosaurs probably were (Sect 7.3). Undoubtedly they were extremely active and, if not actually homeo-thermic, would have generated a considerable amount of endothermal heat when chasing their speedy prey. According to Richard Cowen (in Ellis 2003), they may have breathed in mid-air whilst leaping out of the water - an energetically economical form of high speed locomotion for an aquatic animal (Sect. 5.2.3). Furthermore, they were undoubtedly gregarious, if not fully social, and swam together in large schools as porpoises and dolphins do. Of all reptiles, the ichthyosaurs were the most highly specialised for aquatic life. So fully adapted to a marine existence were they that they never came ashore, but gave birth to ovoviviparous young in the sea. The babies emerged tail first, as do those of whales. (If they were born head first, they would drown.) The external nares or nostrils were set back near the eyes so that the animals had only to break the water surface very slightly in order to breathe. unmistakeable dorsal fin and probably the beginnings of a lobe on the upper surface of its tail. 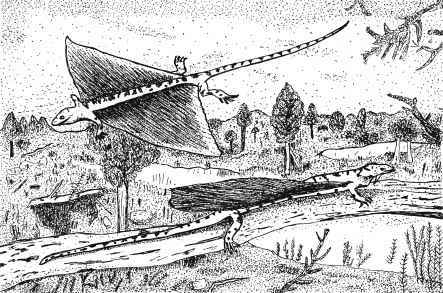 The front paddles were longer than those of the hind pair, and the narrow pointed jaws were well armed with numerous sharp teeth well adapted for catching fishes. These teeth were set in individual sockets, as in Cymbospondylus and other Triassic ichthyosaurs, and not in a groove. The eyes of Mixosaurus were very large, as in later forms (McGowan 1991). The ichthyo-saur eye was surrounded by a sclerotic ring of bony plates. These not only helped in focusing,but protected the soft tissues from the pressure of the water when the animal dived deeply. Apart from details of the skull and the fact that the tail fin was not fully developed for swimming, none of these early ichthyosaurs were very much different from their descendants in the Jurassic and Cretaceous Eras. The massive Shonisaurus (Fig. 41; Shastasauridae) from Upper Triassic rocks in Nevada, North America, was the largest ichthyosaur so far discovered. It enjoyed a number of evolutionary advances over Cymbospondylus. Its shape was decidedly more fish-like, its backbone bent sharply downwards into the ventral lobe of the tail, and its huge frame was divided into approximately equal thirds, viz head and neck, body, and tail. It also possessed a number of structural peculiarities that separate it from the main line of evolution. Its elongated jaws only had teeth at the front, while its limbs were exceptionally long and narrow. Moreover, they were all of equal size - in most of the ichthyosaurs, the front paddles were longer than the hind pair (Palmer 1999). ■ Fig. 43. Ichthyosaurus communis (Ichthyosauridae; Lower Jurassic; length ca. 2 m). (Cloudsley-Thompson 1994). 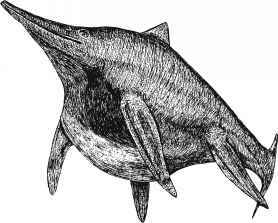 The Triassic ichthyosaur genera Mixosaurus (Fig. 41), Cymbospondylus (Fig. 42), and Shonisaurus (Fig. 41) are represented by numerous fossils and are therefore comparatively well known. Less well represented are Shasta-saurus, Californosaurus, Merriamia, and Toretocnemus,all from the Upper Triassic of California and, in the case of Shastasaurus, also from Mexico and the Palaearctic region. Shastasaurus was the largest of them all and may have exceeded Cymbospondylus in length. Californosaurus reached 3 m; the other two genera were both smaller (±1 m) - about the same size as Mixosaurus. Other Triassic ichthyosaur genera are even less well known. Within each genus, however, some features are primitive, others more advanced. Although Triassic ichthyosaurs were so diverse, two basic types can be distinguished - those with narrow fins, such as Cymbospondylus, Shonisaurus and Toretocnemus, and those with broad fins, including Mixospondylus (McGowan 1991). Similar types were present throughout the succeeding ages. The numbers of genera in the Jurassic and Cretaceous periods were much larger than in the Triassic. Most of the fossil ichthyosaurs found in England are from the Lower Liassic (the lowest strata of the Lower Jurassic), and a few from the Upper Lias. The former belong to the genera Ichthyosaurus (Fig. 43) and Temnodontosaurus ('cutting-tooth lizard' = Leptopterygius; Fig. 44a), the latter to Stenopterygius ('narrow fin'; Fig. 44b) and Eurhinosaurus (Fig. 44c). In Germany, on the other hand, the strata richest in ichthyosaurs are Upper Liassic. Several hundred complete fossil skeletons of Ichthyosaurus spp. have been found near Holzmaden in the shales of southern Germany. The tiny bones of unborn infants, some actually emerging from the bodies of the females, are preserved in a number of them. In contrast to their Triassic precursors, the Jurassic ichthyosaurs had distinct tails while their numerous pointed teeth were set in a continuous groove and not in individual sockets (McGowan 1991). were smaller. Temnodontosaurus was relatively longer and more slender than Ichthyosaurus. Its forelimbs and hind limbs were also relatively larger and approximately equal in length, whereas, in Ichthyosaurus spp. the forefins were usually up to twice the length of the hind fins. They consisted of at least five, and often six or seven digits. In Temnodontosaurus, on the other hand, the fins were relatively narrow and consisted of only three or four digits. This large animal probably cruised in shallow waters, preying upon giant squids and ammonites. In contrast, Ichthyosaurus spp. were better adapted to eating fishes. Ichthyosaurus conybeari had a pointed rostrum with numerous sharp teeth and large eyes. I. brevicaps had a short rostrum so that its large orbits give the skull a remarkably bird-like appearance. Adult Stenopterygius quadriscissus (Fig. 44b) was unusual in having very small teeth, although they were well developed in juveniles, while its fin was exceptionally large. In Eurhinosaurus (Fig. 44c) and Excalibosaurus, the lower jaw was only half the length of the skull. In both these genera, the teeth stuck out sideways along the length of the blade-like upper jaw, as in the modern sawfish (Pristis zijsron) and allied species. The jaw may have served to probe in mud and sand and flush out molluscs and flatfish. 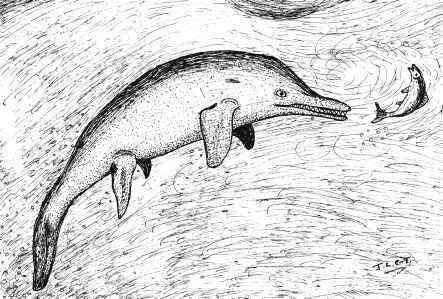 Finally, Ophthalmosaurus (Fig. 44d) was remarkable for its huge eyes whose diameter sometimes reached 120 cm. They occupied the entire depth of the skull on both sides and suggest that their possessor may have fed at night upon squid, the latter preying on plankton-eating fishes (McGowan 1991; Palmer 1999; Ellis 2003). The fossil record gives a distinct impression that ichthyosaurs were very abundant during the late Middle and Upper Jurassic periods, but lacked diversity. If, as seems likely, this is true and not merely the result of chance fossilisation, it would imply that conditions were remarkably uniform throughout the oceans during that immense period of time. Ecological niches must have been relatively few but extremely spacious. These conditions persisted well into the Cretaceous period. Most Cretaceous ichthyosaurs appear to belong to a single genus, Platypterygius ('broad fin') (Fig. 44e) which was widely distributed. Only about five distinctly recognisable species have been described (McGowan 1972), and even these are based on incomplete material. The species known best are P. americanus (Fig. 44e) from North America, and P.australis from Australia. 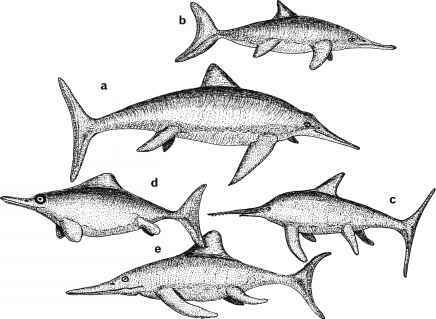 These were the last remaining ichthyosaurs before the group became extinct during the latter part of the Cretaceous, about 25 million years before the end of the period. Platypterygius spp. had small tails in comparison with those of Jurassic forms, and unusually long, narrow fins. They may, therefore, have been adapted for cruising over long distances rather than for sprinting. The fins were robust, and articulated with a large pectoral girdle, so they may have been used for paddling rather than steering (McGowan 1991).